We go to Bedner’s every year! They stepped it up a notch last year, which means that it cost a bit more too, so expect to drop some cash. 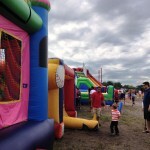 They added some great games (free) for the kids and bunch of bounce houses (not free). The best advice i can give you about this place is that you need to go the first weekend if expect to get good pumpkin patch photo’s. The first weekend the vines on the hay bales are green and look great. 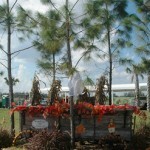 By the end of the season, you will have photo’s of pumpkins on brown hay bales. The second bit of advice is to go early. This place gets very busy! 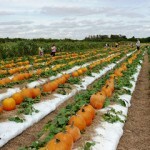 This is the best Pumpkin Patch that I have been able to find. It is a bit of a drive from Fort Lauderdale, but seriously worth it! Bedner’s have a great market filled with beautiful locally grown fruit and vegetables, some of which are grown on property. Weekends in October are the best here due to the Fall Festival! Guests take a ride through the fields on a tractor to the “pumpkin patch”. We got to see an alligator on the way! Pumpkins don’t grow terribly well in Florida, so it’s not a real pumpkin patch, There is an entire field filled with Pumpkins sitting on what looked like cucumber vines. So you get the feel that you are really out picking pumpkins. It is a great photo opportunity! I got several pie pumpkins while we were there and made some great pumpkin pie with it! The grounds are all decorated for fall and Halloween, there is a huge Tiki Hut where you can sit in the shade and enjoy great barbecue and home made ice cream and the best fresh dipped caramel apples ever! 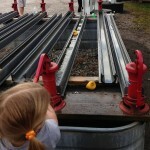 During the summer they also run a strawberry and tomato u-pick. Bedner’s can be found at 10066 Lee Road Boynton Beach, Florida 33473 and the Fall Festival is open Beginning September 27th Saturday 9-6 and Sunday 10-5. Last word of caution: There are alligators in the canals, and while we were at the pumpkin patch I did see a child fall into the canal. He was fine, his mother was in like a flash right after him. However, it is a good reminder of how fast a kid can trip and fall. Please be right on top of your kids at all times near these canals. 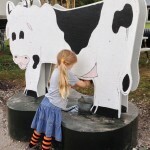 This entry was posted in Events and Reviews, Florida, Holidays and tagged Boynton Beach, Caramel Apples, Fall Festival, Halloween, Hay Ride, Market, Pumpkins, South Florida, Strawberry, U-Pick by Cynthia Buckley. Bookmark the permalink. Looks like so much fun. I am planning to go out there today if weather permits. Are these photos from yesterday? These photo’s were from last years. We are going this weekend and have not been yet this year. We loved it. Just added this years pics,impressions and improvements.